I had planned to make this dish for my upcoming dinner party. The recipe came out of the Gourmet Cookbook, from which I have yet to make a bad dish; that is, until now. Quenelles are named such because of the shape -- any semi-solid food ingredients can be coaxed into a football shape with two large soup spoons. 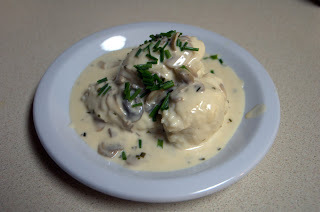 In this case the quenelles are made out of white fish paste, egg white, and heavy cream. I suppose this method came about when there were a lot of fish with too many bones. After the fish is ground up with egg white and then mixed with the heavy cream, the pasty mixture had to be forced through a fine sieve -- an undertaking that I soon realized would prevent me from ever attempting this dish for a dinner party, not to mention I would have had to double the recipe to accommodate the number of guests. The paste was so thick that it took A LONG TIME to get to the final fine paste. The obvious need was to get rid of the bones back when this recipe was devised -- but I started with boneless red snapper filet! In any case the taste was not worth the effort. The quenelles simply tasted like Japanese fish cakes, not as airy/light as the recipe suggested. The sauce, however, was magnificent. And it really couldn't be simpler to make -- cook white wine with shallots and reduce; then add fish stock and further reduce; finally add heavy cream and mushrooms and reduce some more. At least I learned to make an easy seafood cream sauce out of this!